Suffice to say, if you’re a member of the gamma-radiated family in Marvel’s comics at the moment, now isn’t exactly a happy time. Ever since James Rhodes fell to Thanos in the run up to Civil War II beginning, comics fans have been equally concerned about the fate of the other hero waylaid in that attack: She-Hulk, who took an accidental hit from one of War Machine’s missiles during the fateful fight with Thanos. 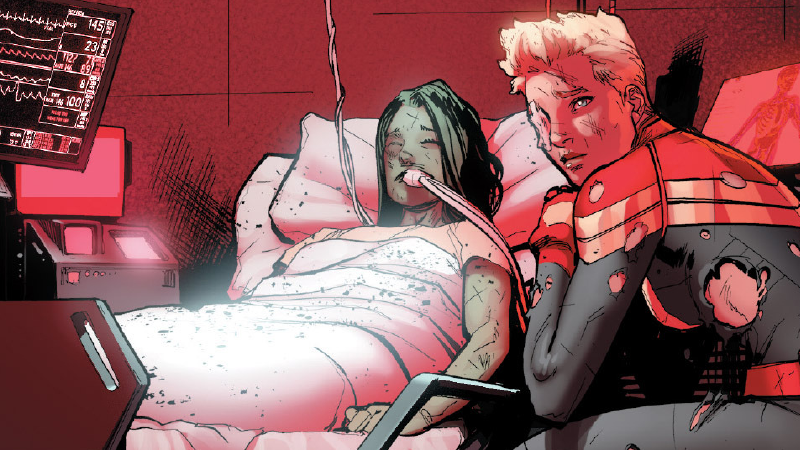 Since the first issue of Civil War II, She-Hulk has been hanging on by a thread, in a coma and deeply unresponsive. It’s been a rough time for Jennifer Walters—her condition even made for an alarmingly heartbreaking issue of usually bright and bouncy Patsy Walker, A.K.A. Hellcat, in which She-Hulk is a supporting character and dear friend of starring hero Patsy—but while she’s been down, fans have been fraught with worry that Civil War II would claim another life beyond War Machine and the Hulk’s. Seriously, go read Patsy Walker, AKA Hellcat #8, and try not to cry. Today’s issue of the series, Civil War II #4, however, reveals that not to be the case (at least, yet). The beginning of the issue opens with Captain Marvel flying back to the Triskelion to discover the impossible—She-Hulk is out of her coma. But not-so-good news: some very bad stuff went down while She-Hulk was out of action, and Carol has to break it to her. The Hulk is dead, and Hawkeye has been on trial for his murder—and, in a surprising move despite the fact Clint Barton both handed himself in and admitted to his jury that he killed Bruce Banner, has been found not guilty. She-Hulk might not have been out of a coma for all that long, but her reaction is... well, it’s a lot less subdued than Amadeus Cho’s was in today’s issue of Totally Awesome Hulk. Oh dear. She-Hulk might be awake and seemingly well after her near-death encounter, but I’d watch out if I were you, Hawkeye. You might not like her when she’s angry.